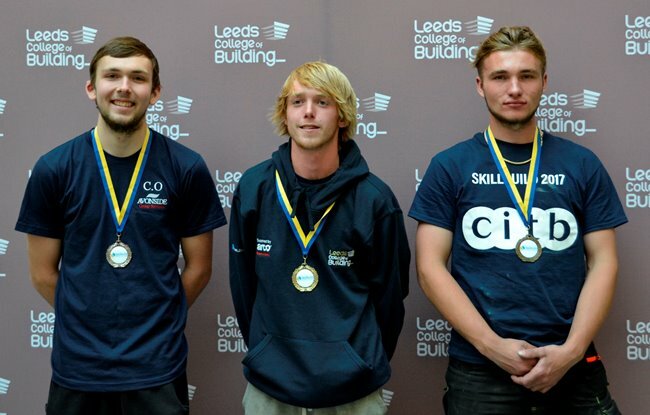 Apprentices from Leeds College of Building have seen off competition from hundreds of other construction students from rival colleges to win 17 top place positions in a range of construction craft and services skills competitions. The College hosted the SkillBuild, SkillPlumb, SkillElectric and SkillFridge competitions for the Yorkshire region at its North Street and Hunslet campuses in Leeds. Its construction crafts students competed in eight disciplines covering 14 categories winning six first place, five second place and three third place positions. Its services students competed in three disciplines covering three categories winning a first, second and third place position. Timothy Smith took first place in bricklaying, Oliver Elmes took first place in carpentry, Benjamin Pick took first place in joinery, Jordan Kitching took first place in plastering and drywall systems, Harry Pennock took first place in roof slating and tiling, Jack Wray took first place in wall and floor tiling and Tom Bottomley took first place in the SkillFridge competition. Mark Sims, who is a plastering lecturer and Leeds College of Building’s competition co-ordinator, said: “This years’ results were outstanding. Everyone worked so hard, and these results would not have been possible if it wasn’t for the dedication of each competitor and every individual who trained ourstudents to the impeccable standards required to compete against other colleges. Shaun Ward, Abigale Johnson, Charlie Oakes, Callum Pearson and Luke Calvert all gained second place positions and Louisa Tolson, James Tidswell and Jacob Wall all gained third place positions. The highest scoring competitors from all of the regional heats will now go on to take part in three days of intense competition at the National Skills Show at Birmingham’s NEC from 16 – 18 November. They may also get the opportunity to represent the UK in the international skills competitions – EuroSkills and WorldSkills. SkillBuild, which has taken place for more than 45 years, is organised by the Construction Industry Training Board (CITB) and sees the very best in construction talent compete against each other to be crowned SkillBuild winner in their chosen craft. SkillPlumb is organised by qualification provider BPEC, SkillElectric is organised by National Electrotechnical Training (NET) and SkillFridge is organised by Datateam Business Media – all of the competitions are part of the WorldSkills event. Tipi company asks “Who Are Yorkshire’s Most Inspirational Individuals”?